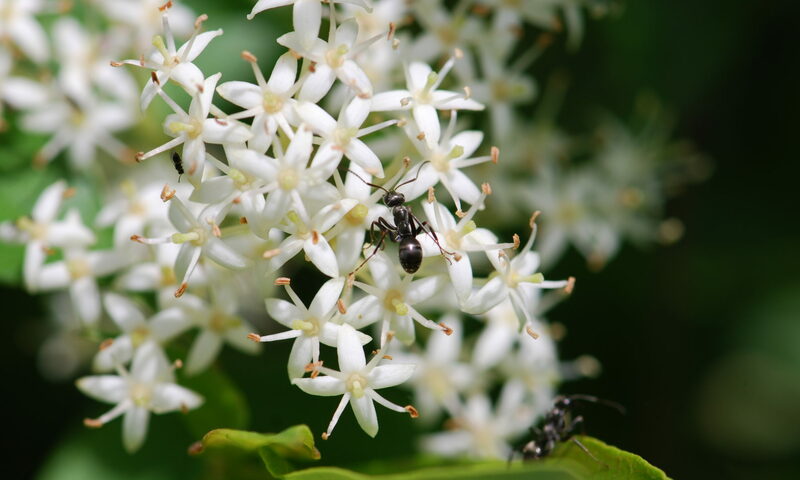 Ants are commonly known to tend Homopterans, such as aphids, scales, etc. But what is this ugly thing? Obviously it is attractive to ants. (I know, the photos aren’t the greatest). Wow, that one is popular. The plants these structures are on are oaks (Quercus). I believe they are Emory Oaks, but please let me know if they aren’t. The reddish-brown structures are galls caused by cynipid wasps. There are a number of species that cause galls on oak trees, in particular. 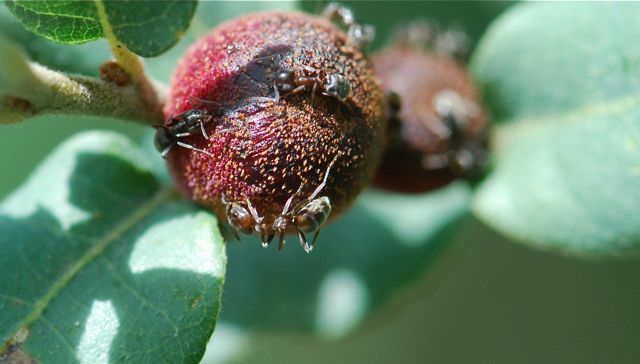 The galls of some species secrete a sweet substance that is attractive to ants. 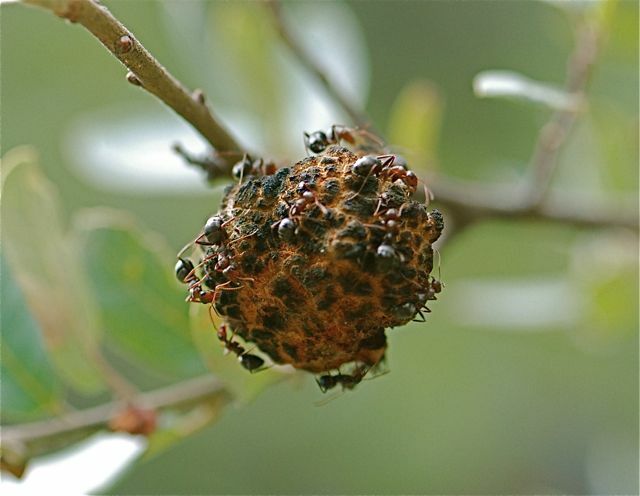 This one is a bit puzzling because the presence of ants are thought to protect against predators and parasites, but what could attack a gall wasp hidden inside a gall? Wouldn’t that plant tissue disguise and protect it? It turns out that there are parasites that can kill gall wasps. In fact, scientists have shown via exclusion tests (by preventing ants from reaching galls), that survivorship of certain gall wasps is significantly increased when tending ants are present. Security, and the gall wasps don’t even have to supply the payment. Now that’s sweet. T. F. SEIBERT (1993). 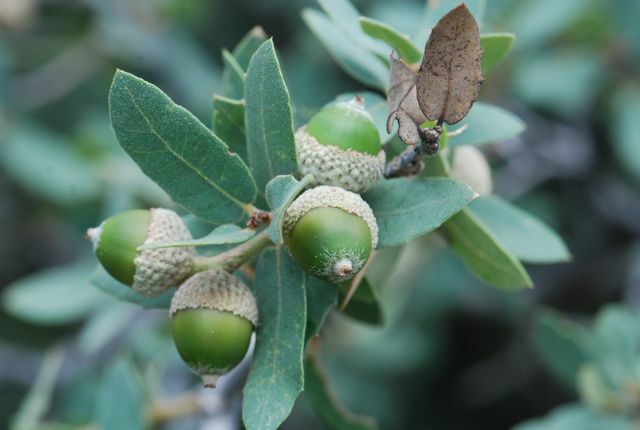 A nectar-secreting gall wasp and ant mutualism: selection and counter-selection shaping gall wasp phenology, fecundity and persistence. Ecological Entomology. 18(3): 247-253. Very interesting. Do you know what causes the gall to secrete the sweet solution? Is it a function connected with the occupant species, or the species of the host tree? I think when it comes to oak galls and ants, there are currently more questions than answers. Because there are numerous cynipid galls that are not tended, secretion would seem to be related to the gall species. You’ve given me a lot to think about with this post. A cedar elm sapling in the front yard has a number of aphid-ish lumps on it that are definitely attractive to ants. I’ll watch them closely. I’d love to hear what you find out. Glenn Keator’s book, The Life of an Oak, has a good introduction to gall wasps on several species of western oaks. Thank you so much for letting me know about that. It looks wonderful. I’ll be sure to pick that up. Interesting! I found your site after noticing ants all over some new galls on a bur oak seedling in my front yard. Your photos are better than mine, but a couple of them are at http://www.flickr.com/photos/esagor/4752683184/ and http://www.flickr.com/photos/esagor/4752684390/. Thanks for the post, including the link to the study. Very interesting indeed! Thanks for sharing your photographs. Always like to see what those ants are up to. 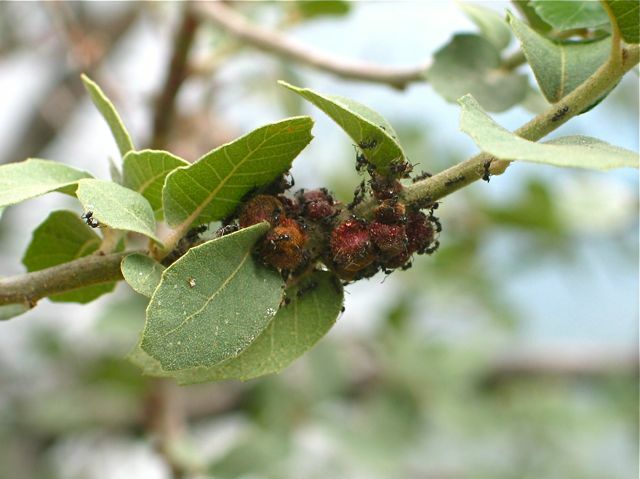 The bunch of round structures that the ants are tending are called bullet galls. These cynipid (gall wasp) galls secrete a sugary exudate late in the summer, while the cynipid larva inside each gall is actively feeding, that attracts a lot of stinging insects, at least in Florida. The species that I’ve worked with on live oak is Disholcaspis quercusvirens. This is likely another Disholcaspis species. Thanks for the info, Eileen. I saw yesterday several galls from last year that when broken open, contained 5 or 6 live ants. Do ants move in after the wasp leaves? I just saw a paper about this, and do you think I can find it? Anyway, ants can and do enter galls. I collected a load of large oak apples here in Tuscany last winter. I sanded them smooth and painted them different colors to make beautiful natural ball toys for kids. They love em. I noticed…a little to my dismay that a species of ant appeared to be living in the vacated gall. I learnt today about the life cycle of the gall wasp (extremely interesting) and so went to look for the new developing balls. I found them…and noticed that the same species of ant were going crazy over them like they do when they are farming the affids. Interesting that the gall might be excreting a solution they find irresistible. To help protect them. That makes sense. 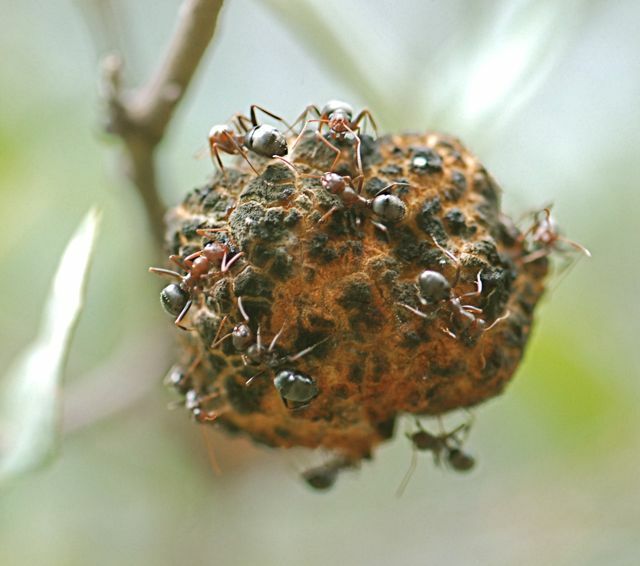 Also the ants have another reason for prtecting the newly developing galls…because they become their homes. I THINK!? That is a very good observation.